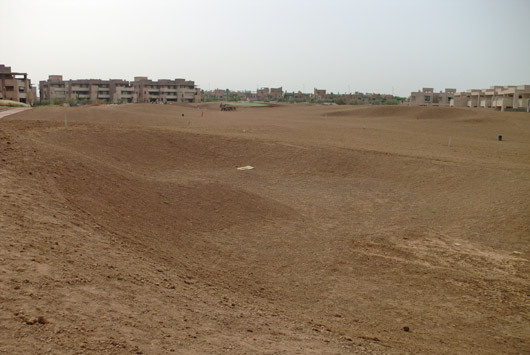 The pace of work in Marrakech has been picking up recently as the contractors race to get tees and fairways seeded with bermuda grass before the temperatures drop in the Autumn. This has meant frequent trips to Marrakech throughout July and August and many hours spent on site in the baking sun. Thankfully the temperature on site this week topped out a bearable 44c which was much easier to work in than the 52c experienced on the previous visit! This week saw approval of the first three holes to be seeded with Bermuda grass with another 3 expected to be ready in September and the earthworks well under way on 3 more.